In May of 2011, Instagram made waves when it revamped its website and offered a full-fledged web experience to desktop users. In a move to become more accessible in parts of the world where cellular data isn’t widely available, Instagram launched a website that closely resembled using the mobile app. Users could scroll through their feed, watch Instagram stories, and discover new content via the Explore tab. The website, however, was missing one key functionality. In fact, you've probably noticed! 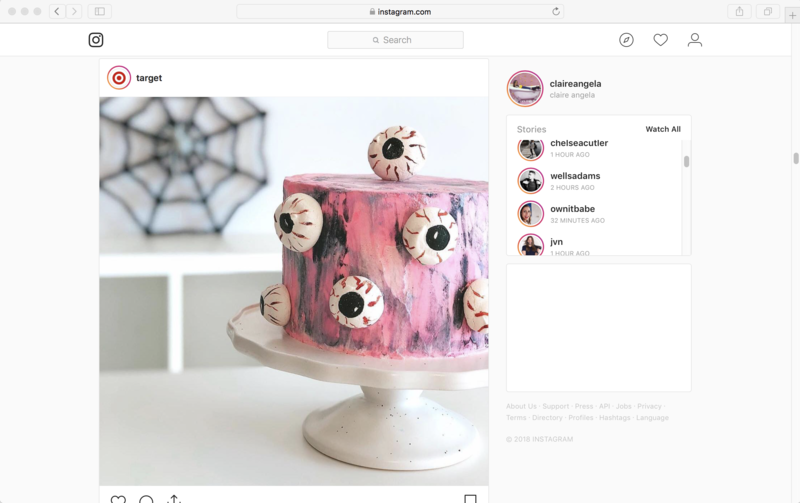 Have you ever visited Instagram's desktop version and wondered exactly how to post on Instagram? That's right – it's not possible! What you may refer to as Instagram’s most important feature was nowhere to be found. Missed opportunity on Instagram’s part? Maybe. Frustrating to the Instagram user? Almost definitely. But is posting on Instagram from a computer impossible? Not exactly. That’s right! With a few simple tricks and hacks, it is possible to post on Instagram from a PC. If you’re interested in learning how to do this, then you’re in luck! This guide will walk you through the process step-by-step. Before we get started on the details, we’ll cover a few reasons why you may want to post on Instagram from a PC. 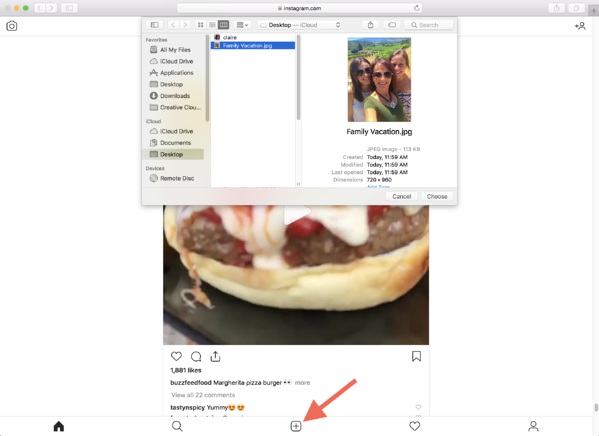 Why post on Instagram from a PC or Mac? Depending on your profession or hobbies, you may find it easier to post from a computer instead of a phone. For example, maybe you’re a photographer – either professionally or as a hobby. You’re probably snapping pictures on your DSLR and uploading them to your computer to edit. If you’re looking to post the pictures on Instagram, then sending them to your phone after only adds a step to your already-tedious process. Or perhaps, you’re a social media marketing manager that handles all of your company’s various social media profiles. 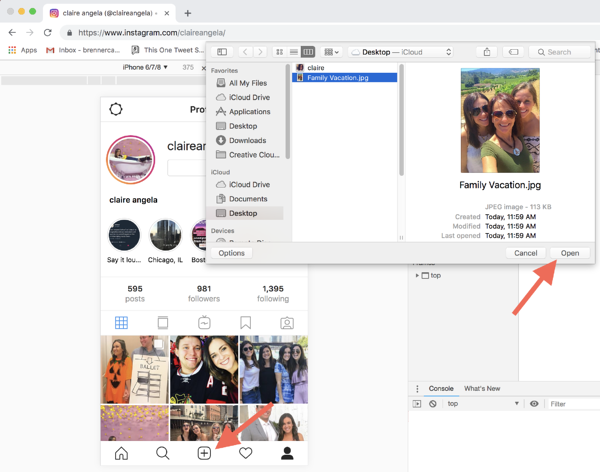 The ability to post on Instagram from your PC enables you to have all of your profiles up side-by-side while constantly keeping an eye on your social media analytics software. Whichever your reasoning, posting on Instagram from a computer can make your life much easier. Plus, there are a variety of ways to do this, so you can choose the method that works best for you. 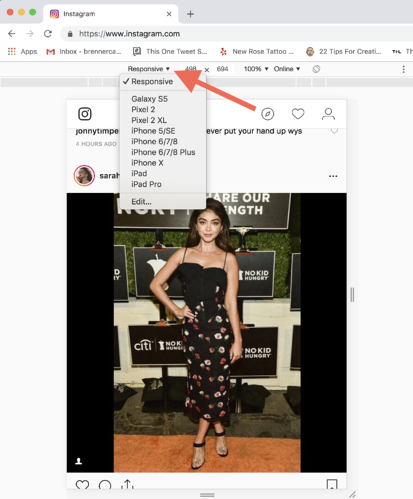 There are two main methods to post on Instagram from your computer. Depending on your desired functionality, one may work for you better than the other. The first way to post on Instagram from a computer is to change your computer’s user agent. Don’t worry – it’s less complicated than it sounds. This is actually the more simple method because it doesn’t require you to download any third-party apps. So first, what’s a user agent? Well, to put it simply, a user agent is software that acts on behalf of the user. When you visit Instagram from your computer, you won’t see the upload button because it recognizes that you’re not on a mobile device. By changing the user agent, you can essentially “tell” your browser that you’re visiting the site on a mobile device. The upload button that appears on mobile will then appear on your computer. Now, how exactly do you change the user agent? Don’t worry – we’ll take you through the process now. Posting on Instagram by changing your user agent is easy, regardless of which web browser you use. Let’s start with Google Chrome. 1. The first step is simple! Open Google Chrome and go to www.instagram.com and login to your account. At this point, it will still look like your typical desktop version of Instagram – basically, it’ll just be missing the upload button. 3. This will open the console on the right side of your screen. In the top left corner of the console, you’ll see an icon that looks like a phone and a tablet. Clicking this icon will change the user agent on your device. 4. From here, you’ll see a drop-down menu below your search bar labeled “Responsive”. Click on this, and select a device. Your view will be based on the device you select, so I selected the iPhone6/7/8 Plus since that’s the phone I have. 5. Now that you’ve changed the user agent, you’re almost there. However, you may not see the upload button just yet. 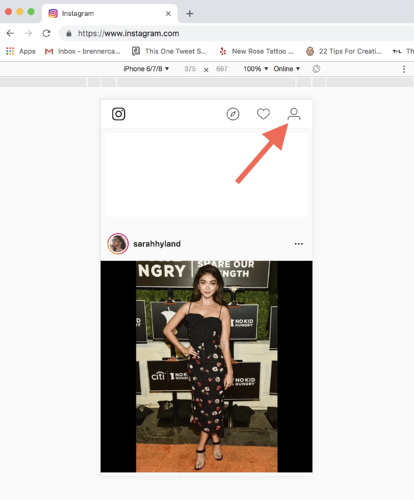 To solve this, navigate to your own Instagram profile but clicking the silhouette button in the top right corner, refresh the page, and the upload button will appear! 6. From there, post on Instagram as you normally would. When you press the upload button, it will pull up your files (in place of opening up your phone's camera roll). Select the picture you are posting and press open. Then, consider adding a filter and caption, or tagging your location. 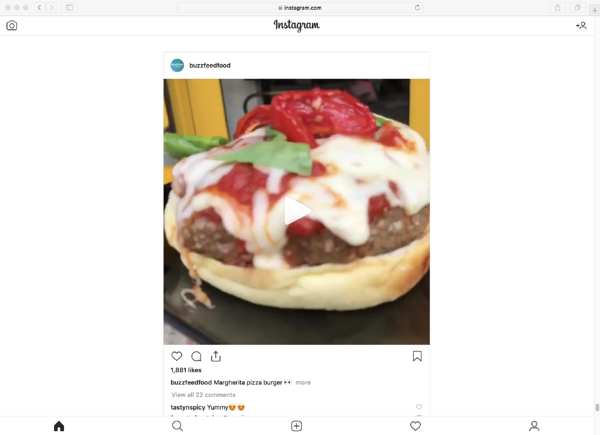 Posting on Instagram from Safari is a very similar process to posting on Instagram from Google Chrome. The only aspect that’s a little different is the way you go about changing the user agent. 1. First things first, open Safari, go to www.instagram.com and login to your account. 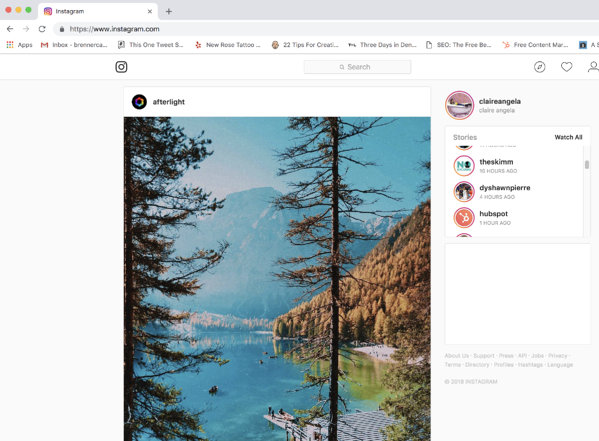 Similar to Google Chrome, it will look like your typical desktop version of Instagram and only be missing the upload button. 2. To change the user agent, click on the “Develop” drop-down menu at the top of your screen. From there, select “User Agent” – this will open another drop-down menu. 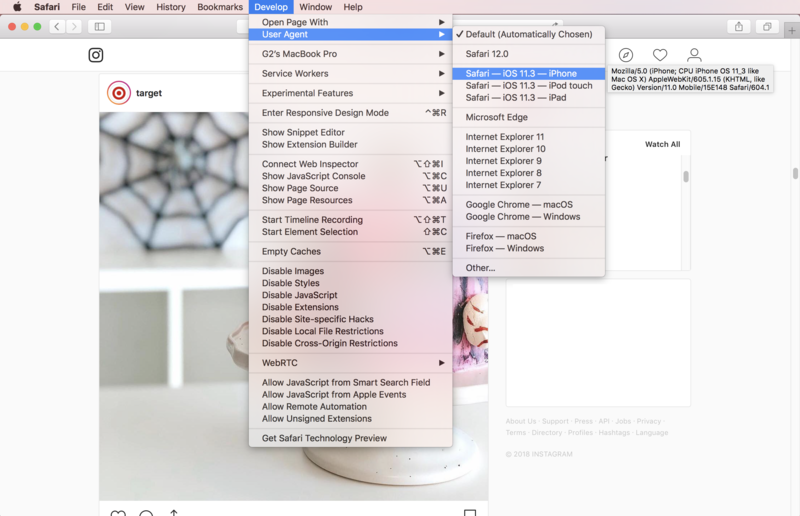 Then, select “Safari – iOS 11.3 – iPhone”. 3. Immediately, the upload button should appear at the bottom of the screen and Instagram will look as it does on your mobile device. There should be no need to refresh, but if you don’t see the upload button, simply navigate to your own Instagram profile and refresh the page. 4. From here, you can use the upload button to post on Instagram as normal! While posting on Instagram by changing your user agent is simple and free (who doesn’t love simple and free?! ), it’s important to keep in mind that it does come with some limitations. For example, you’re unable to post videos or multiple photos at once. While you have access to the Instagram filters, you aren’t able to use the accompanying editing tools. And while you can tag locations, you can’t tag people or accounts in the picture itself. If these are features you can live without, then this is the method I’d recommend for you. However, if you’re adamant about using those particular features, don’t fret! You still have options. There are a variety of third-party apps you can download or purchase that will allow you to post on Instagram from your PC, some with more functionality than others. We’ll be covering two of the most comprehensive. 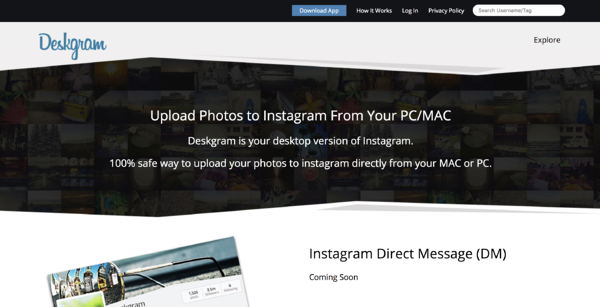 The first third-party application we’ll cover is Deskgram. 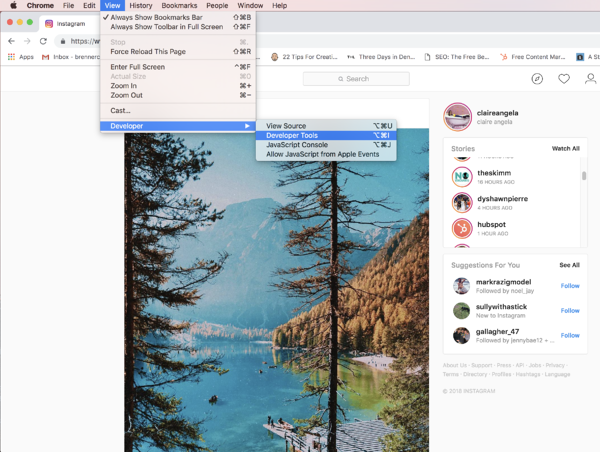 Deskgram.net is self-described as “your desktop version of Instagram,” claiming to be a 100 percent safe way to post on Instagram from a Mac or PC. The app, which requires the Google Chrome Browser, is available for a free download on the website. However, the free version only allows you to browse through your Instagram feed. To be able to post on Instagram from your computer, you’ll have to upgrade your account for $2.99/month. If you’re using a Mac and would like the ability to post videos on Instagram from your computer, this could be a worthwhile investment for you. However, if you’re a Windows user, it’s important to note that video upload is not an included feature. 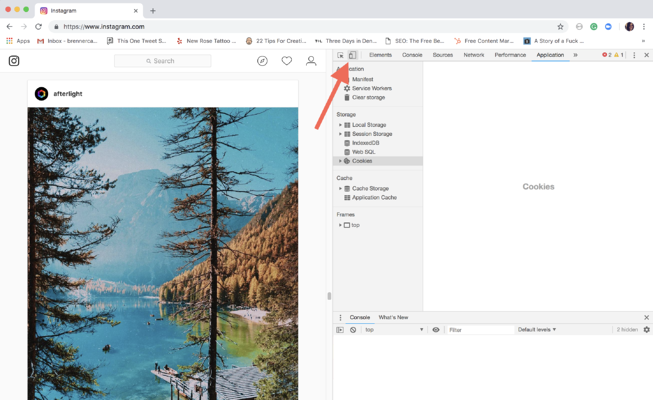 Deskgram also lacks Instagram filters and the ability to tag location – both of which are available features when you change your user agent. 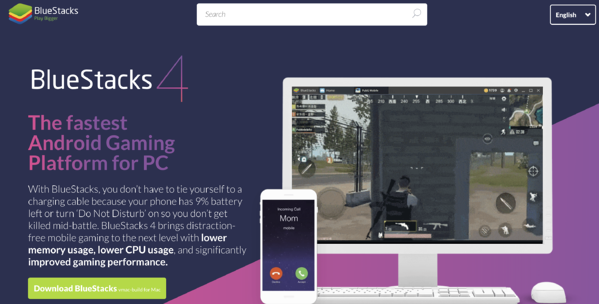 The next popular third-party app is Bluestacks. You may have already heard of Bluestacks – especially if you’re a loyal Android user. That’s because Bluestacks isn’t primarily for posting on Instagram from your computer. Instead, it’s an app player that enables users to run a variety of Android applications on their computer. Not only is Bluestacks free, but it also offers nearly all of the Instagram features available to you on a mobile device. You can upload photos, videos, and posts with up to 10 different images. Additionally, you’ll have access to all filters and editing tools, plus the ability to tag locations and accounts. The process may be a bit longer than changing your user agent – you’ll need to create a Bluestacks account using your Google account, install the Instagram app, and upload your photos to the platform’s Media Manager. However, if you’re willing to commit a bit more time in exchange for all of the features, this may be the best option for you (helpful hint: this can be an excellent tool for marketing professionals who are heading up an Instagram marketing strategy). Time to start posting on Instagram! Now that you have all of the information you need to post on Instagram from your PC, it’s time to get started! 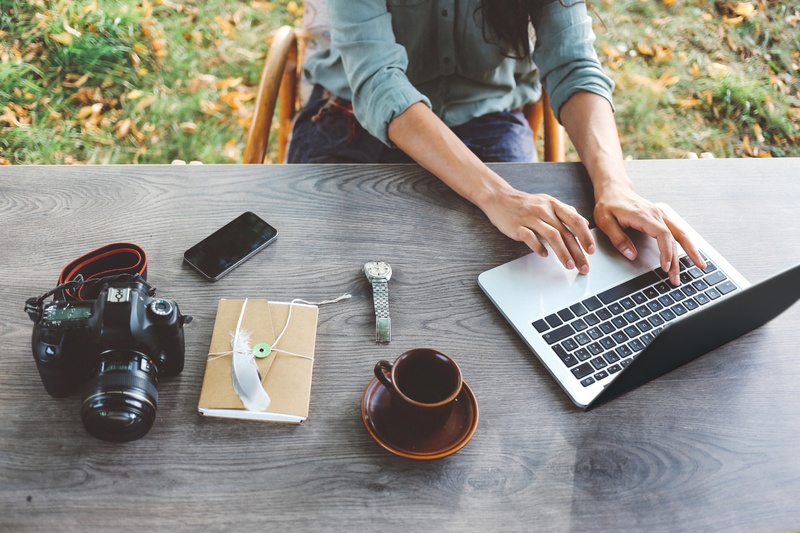 Are you a social media marketing professional looking to get started on Instagram? Check out our step-by-step guide on how to create an Instagram business profile, as well as how to repost on Instagram.